On 17 April 2014, the Band was invited to a reception in the Mayor’s Parlour to celebrate our success in retaining the World Championship for a third successive year. In the process the Mayor, Councillor Stephen McIlveen presented Chairman Stephen Carse with a plaque and a recently published book on Newtownards. Click for photo - Band photo on our Photos & Trivia page. Calling all flute players young & old, novice & professional, active or retired for THE BIG FLUTE CHALLENGE on 13 September 2014 in the Kings Hall Complex, Belfast. For charity, the plan is to set up a new world record for the largest flute ensemble ever assembled. The 2014 Flute Band Association Own Choice Contest was held in Lisburn on Saturday 01 March, and the audience were treated to a fine day of music. The adjudicator Dr. Windsor Hylands thanked the Association for the invitation, adding that the players and conductors deserved great credit. He said he had been looking for all aspects of musicianship including good percussion, tone production, tuning, intonation, balance and phrasing. He also wanted the bands to be operating as a team, playing with flair, interpreting the composers’ wishes, and making the hair stand on end. Dr. Hylands reported three very good performances which were difficult to separate because they were not like for like in terms of the different choices of music. Having said all that, he announced Ballylone the winners with Ballygowan a close second and Kellswater a close third. 2013 World Championship Adjudicator’s Remarks are now on the Scrapbook page. We’ve been asked to advise a change at the Scottish Amateur Flute Band Association. Sadie Houston has stepped down as Secretary; the new secretary is Yvonne Allan who can be contacted at enquiries@safba.org.uk. Sadie continues as Registration Secretary. 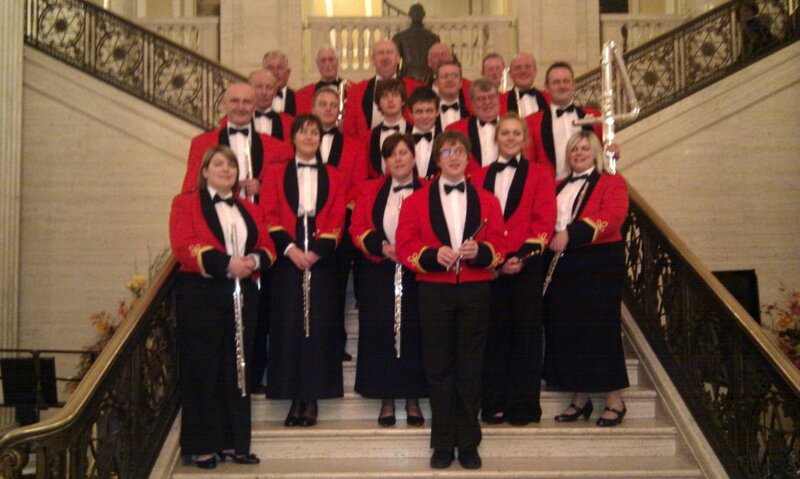 On Friday 10th & Monday 13th January 2013 an ensemble from the Band played at Masonic dinners in Comber & Killyleagh resp. Both concerts went down very well. On Sunday 29 December 2012 we played carols for the Rotary Club of Comber’s annual Christmas Tree service., and the Reverend Lesley-Ann Wilson of First Comber Presbyterian Church officiated. The service was not well attended, but was thoroughly enjoyed by everyone, and we received many compliments for our playing. On Monday 09 December 2013 we played for the Ballygowan Community Association at their children’s Christmas party. It was a very well attended and lively evening, and the kids particularly enjoyed themselves with some raucous singing. Click for photo. Next engagement before Christmas is on Sunday 29 December 2013 from 2:45PM in St. Mary’s Church in Comber Square. We are responding to a request from Comber Rotary Club to play at their annual Christmas Tree Thanksgiving Service (everyone welcome) . On Sunday afternoon Sunday 27 October we joined up with Ballylone and Cahard for a Massed Flute Band Concert in Saintfield’s Harvest Music Festival. The concert was in Second Saintfield Presbyterian Church, and was enjoyed by a good sized audience.The varied programme included readings by Edward Craig and Phillip Poots. Edward conducted the Grosvenor Chorale who also lead the harvest hymns. Richard Douglas accompanied the singers on the concert flute in a special arrangement of “Last of the summer wine”, and Richard conducted the massed bands - the seven pieces included solos by Gillian Burrows of Ballylone, and Andrew Douglas of Ballygowan. Our Night at the Races on Saturday 26 October 2013 - Gourley’s, Ballygowan was a great night’s craic. The Band won the World Flute Band Championship in Armagh on Saturday 12th October 2013, and in so doing completed our first ever hat trick of wins in this competition. The adjudicator was Richard Evans who was making a return to these Band Championships after almost 30 years. Born in Aldershot, he is one of the best known and most respected of Bandsmen, and he has played, conducted and adjudicated all over the world. Richard opened by hoping that the audience had been in the hall to hear all the bands. He said he was knocked out by the winning performance – referring to the Band as “worthy World Champions”. He then chose to read out each Band’s remarks and scores; Hunter Moore were third 191 points, Ballylone were second with 194 points, and Ballygowan finished with 197 points. Ballygowan also took a clean sweep on all available prizes – winning Band, Conductor’s interpretation, best piccolo player, best percussion and the City of Dublin International Festival Trophy for the best overall performance of the day. We wish to express our sincerest thanks to Steven Cairns who stepped in as Conductor for this contest. It has been a privilege and pleasure to work under Stephen’s baton. The test piece was Berlioz’ Roman Carnival, and is one of several of his works chosen as test pieces in past years – including Benvenuto Cellini, Le Corsaire and Les Francs Juges (the latter was a failed opera of which little other than the overture survives). He based Le Carnaval Romain on his opera Benvenuto Cellini, and it includes music from the carnival scene. Written as a stand-alone piece, it was premiered in Paris in 1844. Hector Berlioz was born on 11 December 1803 near Grenoble in France. His father was a doctor and had a family of six, three of which sadly did not reach adulthood. Unlike many of the great composers, he had not been a child prodigy, and had not shown much interest in music until he was twelve. He was not formally trained in his early years, and learned music from books; he played guitar and flute and flageolet but not piano. He was once blown away at a performance of Beethoven’s 5th symphony, but in his own turn he was to make a massive contribution to the classical scene, influencing people like Wagner, Lizst, Mahler, Richard Strauss and Rimsky-Korsakov. He also worked towards a bigger sound and often conducted 1,000 strong orchestras. Initially he started to study medicine but had no interest in anything other than music. He regularly read through scores in the Conservatoire, and by twenty years of age, was a keen writer and composer. In spite of his father’s advice, he abandoned medical studies and studied music privately under Lesueur. In 1826 he started attending the Conservatoire. Here he won the Prix de Rome at his fourth attempt; this gave him much needed income, with a commitment to study in Rome – something he did not particularly enjoy. He was to become a well respected and well travelled conductor although, strangely, he never held a permanent post. He was also a successful writer and critic - while he enjoyed this work, he would rather have been composing, but it was a welcome source of income. His best known work was his Symphonie Fantastique which he finished in 1830 – believed by many to be the best first symphony of all time, it is apparently autobiographical. Franz Lizst later transcribed it for piano so more people could hear it. Generally, in his own country he found success and recognition hard to come by; indeed, in his life time, he received much more criticism than praise from French commentators. No doubt this caused him to say on his deathbed “At last, they are going to play my music”. He died on 08 March 1869. We are delighted to have secured the services of Steven Cairns as conductor for the approaching N.I.B.A. World Flute Band Championship. Stephen is well known and highly regarded in banding circles, and we are already enjoying working under his baton. We had a great day in Banbridge on Saturday 31 August 2012. The occasion was “Black Saturday” and the streets of the town were well lined with people. The weather was great and the music went down well. His set of old system flutes were accidentally dumped and lost forever, and he is keen to buy (or have donated) any flute(s) currently surplus to requirements. e.g. Hawkes Crown AZ... Bb Bass flute (curved head), Eb Bass flute & Eb Piccolo. Any band or individual wishing to help, please contact us at webmaster@ballygowanfluteband.com or use the contact us link on our home page. The Band gave a concert for Ards Borough Council on 18 August 2013 in Comber Square. This was one of six summer band concerts organised by the Borough Council. A large crowd gathered on a fine Sunday afternoon, and the music was very well received. - Summer Band Concerts (more on our scrapbook page). Our next engagement is “Black Saturday” in Banbridge on August 31, followed the next day by a concert in Lord & Lady Dixon Park (playing from 3:00-4:00PM). We are currently on the look out for a musical director or guest conductor, after Colin Fleming informed us that he did not wish to continue in the role. There was general agreement in the ranks that Colin’s commitment to improving flute playing could not be understated, and we regret losing his services. On Thursday 21 June 2012 the Band honoured a commitment to play at the Drumbo Ulster Scots Champions concert. It was a very enjoyable evening, and we trust the remainder of the concert and the barbeque went well. The Park season is upon us again, and the Band played in Lord & Lady Dixon Park on Sunday 12 May 2013. Congratulations and thanks to those members of the public who braved the weather -they didn’t get wet, but they weren’t to know that when they left home! We also enjoyed a couple of social evenings in Ballygowan recently, recently won medals were presented, the annual BBQwas held at Dougie’s farm on 14 June. Benjamin Gourley (3rd in U13 Concert), Andrew Douglas & Tori Watson (2nd in U21 Duet), Andrew Douglas (1st in the Own Choice Open Solo), Drew Vincent (1st in the Open Solo Side Drum), Andrew Douglas, Laura McBride, Tori Watson, James Gourley & Mark Douglas (1st in the Senior Trio-Octet), and a special mention goes to Tori Watson who won the Novice Side Drum section...you could make it into the percussion section yet! Thanks to all the competitors for your hard work and also to the Flute Band Association for organising another great event. At our 2013 AGM, Stephen Carse was re-elcted as Chair, Victoria Gibson moved from Secretary to Treasurer, and Laura McBride took over as Secretary. Two good friends of the Band were elected as honorary members. Further down this page you can read about the Band having played in the world première of the march “Flags and Emblems” at the Belfast Festival at Queens in October 2012 - subsequently broadcast on BBC Radio 3. The pianist Matthew Schellhorn and the composer Ian Wilson were duly elected as honorary members to demonstrate the members’ appreciation of the respect they conferred on and the faith they showed in Ballygowan Concert Flute Band. The 2013 Flute Band Association Own Choice Contest took place in Lisburn on 23 February. Bandsman, flute player, tutor conductor and adjudicator Drew Rowan was in the box for the Championship section, and he opened with his thanks to the Association for asking him back. He said he was thrilled with the wide range of music and terrific playing. Ballylone won, Ballygowan were second and Ballymena were third. Ballylone lifted all the available prizes - interpretation, percussion, piccolo, best of the day. The test pieces were Slavonic Dances (Dvorak), Morning, Noon & Night (Suppé), The Sorcer’s Apprentice (Dukas), Ballet Music from Zemirz et Azor (Gretry), Night on the Bare Mountain (Mussorgsky) and Dvorak’s Carnival Overture. For Ballygowan, this was the thirteenth successive year of top-two finishes. On Monday 11 February, an ensemble from the Band played at a Masonic function in Killyleagh. An ensemble played in Crawfordsburn at a Masonic dinner. We were made very welcome, and the music was very well received (some photos in our Photos & Trivia page). The Band fulfilled a long standing engagement for the Ballygowan Community Association on Wednesday 05 December 2012 by playing carols and other items after the kids had their party and had seen Santa. The 2012 NIBA Dinner and prize giving took place in Tullyglass House Hotel, Ballymena on Saturday evening 10 November. Ballygowan were there to collect the Championship Section winners trophy, the Best of the Day Trophy and the Interpretation Trophy. The Band was well represented and a number of ballot prizes also made there way back to Ballygowan. As usual, the adjudicator’s remarks were available on the night, and to Ballygowan eyes, they made good reading - including the summary “very, very, classy performance”. The full set of remarks for the Championship Section is on our Member page, and there a few photos on our Photos & Trivia page. Some of our members joined other bands-people and flute players to play in a charity concert to raise money for an MRI scanner for the children’s hospital. The concert was in the Waterfront, Belfast on 15 November 2012. We played two pieces - Selection from the musical Oliver, and Klesmer Carnival. The ensemble was organised and conducted by Richard Douglas, and the music was very well received by a large and appreciative audience. In the Market Theatre in Armagh on Saturday 20 October 2012, Ballygowan retained the N.I.B.A. World Flute Band Championship playing Brahm’s Academic Festival Overture. Ballygowan were placed first with Ballylone second, and Ballymena Young Conquerors third. Ballylone took the percussion and piccolo prizes, and Ballygowan were awarded the interpretation and best of the day. However we are deeply shocked and hurt at the wanton vandalism on one of our new doors. We appeal to all our friends and neighbours to please be vigilant, and have no hesitation in calling the PSNI if you see or hear anything suspicious. We were saddened to hear recently of the passing of Fergie Cobain. Fergie was a life-long member of the Ballyclare Victoria Flute Band, and a former conductor of Ballygowan. He was well liked and very much respected in banding circles, and he made a tremendous contribution as player, conductor, arranger and adjudicator. It was very fitting that Ballyclare should play only his arrangements at his funeral service. Fergie was truly one of the good guys, and he will certainly be missed. The Championship test piece for 2012 was the Academic Festival Overture by Johannes Brahms, arranged for flutes by Philip Walton. We are delighted to have the services of Colin Fleming as conductor. Brahms composed the overture as a means of thanking the University of Breslau for awarding him an Honorary Doctorate. Apparently he had planned to write a note of thanks, but was advised that protocol demanded much more. Brahms conducted the premier himself in January 1881, and the piece has been a regular concert favourite ever since. The composer was well known for his sense of humour and he included a number of student drinking songs – which didn’t go down well with some of the “stiffer” academics present in the audience. Johannes Brahms was born in Hamburg in 1833 as the second of three children. His father was a double bass player, and Johannes was introduced to the piano at the age of seven. In a very short time it was realised that here was a child with a musical gift. As a young lad he played for pocket money in Hamburg bars – an unpleasant experience considering the typical clientele in the pubs of such a large port. By the age of seventeen he was already an accomplished musician, and while still twenty he visited and played for the composers Robert and Clara Schumann. This was the beginning of a great friendship which was tragically affected by the loss of Robert Schumann’s mental health and his premature death. In 1857 he was appointed Director of Music to a princely court near Hanover, and in his time there he composed his first piano concerto. By the time he was thirty he was living in Vienna, and his music was selling well (no small thanks to Clara Schumann who played his piano pieces). Brahms completed his first symphony in 1876, and his 40s and 50s were recognised as his golden period. Johannes himself was a shy person and led a simple life; he rarely expressed his inner feelings except in letters to close friends and through his music. He died of cancer in April 1897. A party of over thirty made the trip to Troon for the Scottish Amateur Flute Band Association Spring Contest on 12 May 2012. The Band played the march Eagle Squadron, and the test pieces Irish Washerwoman, Aranjeuz mon Amour (Rodrigo) and the William Tell Overture (Rossini). The general reception in the hall was that the performance was the best of the day, but as all bands people know, there is only one opinion that matters - that of the adjudicator. No prizes on this occasion in spite of the many compliments - we’ll keep rehearsing! Our congratulations go to our solo “G” player Richard Douglas, who scored his first win as a conductor of a senior band. 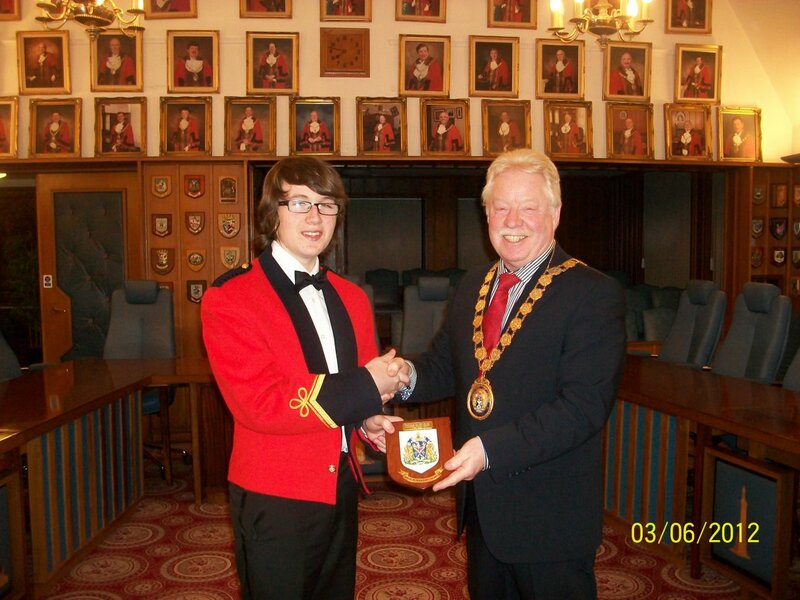 Ballymena Young Conquerors under his baton won the march, the best Band and the interpretation prize. Ballygowan quintet won the Trio to Octet section of the 2012 Flute Band Association’s Annual Solo & Small Contest. From the left: Mark, James, Tori, Laura & Andrew. Tori and Andrew won the Duet and Andrew won the Open Solo (he first won it as a promising 12-year old. Sadly the entries this year were very low. The adjudicator’s remarks for the 2012 Flute Band Association Own Choice Contest were released at the Annual Dinner on 31 March. From a Ballygowan perspective, these made excellent reading. Mr. Sandy Hay used terms like very moving, very, very stylish, a huge palette of colours that you exploit, impeccable and effortless, your playing is so enjoyable that I find myself forgetting to write, your band can articulate as a unit like no flute band I have heard before, a dynamic and stunning performance. He also found space to record that we have an astounding conductor. There are a couple of photos in our Photos & Trivia page. 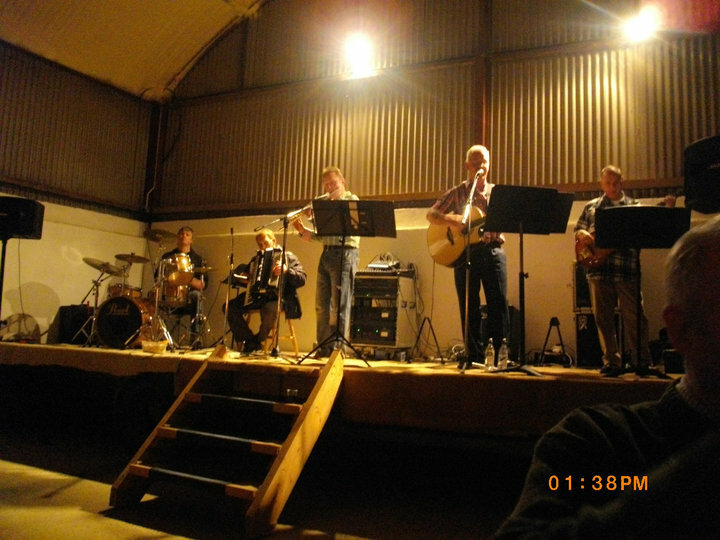 On 21 March 2012 members of the Band gave a concert in the Village Hall for the Ballygowan Community Association. The idea was to help raise funds for the Fun Day in June. Acoustics are very good in the hall and the concert went down very well with those present, and there was a special reception for Northern Ireland’s Young Musician 2012 when he played the solo in Sousa’s Stars & Stripes Forever, and the piccolo solo Bourré. On Tuesday 06 March 2012, members of the Band with Musical Director Dr. Windsor Hylands and his wife Isobel - also Libby Douglas (Young Musician’s Mum) were invited to a reception by Newtownards Borough Council. The Mayor of Ards Councillor Mervyn Oswald showed a remarkable knowledge of the Band’s history and successes and wished everyone continued success. He then presented Andrew Douglas with a plaque to acknowledge his winning of the 2012 Northern Ireland Young Musician Competition (click for photo),. 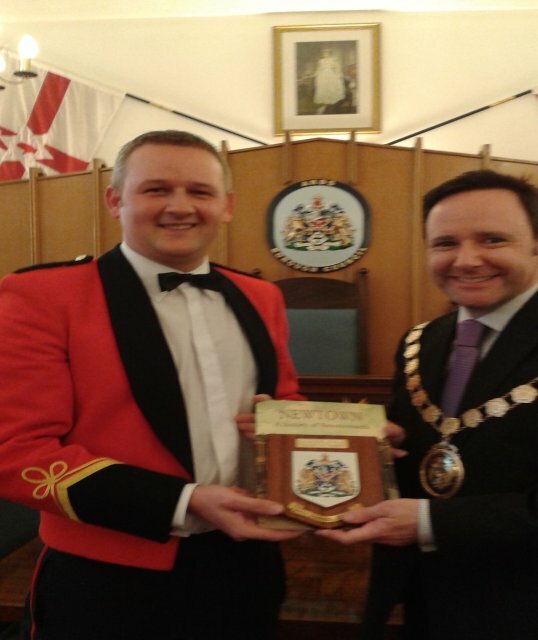 He also presented the Band with a plaque in recognition of the credit brought to the Borough by winning the Flute Band Association Own Choice Contest in successive years and the North of Ireland Band Association World Championship in October 2011 - click for photo. 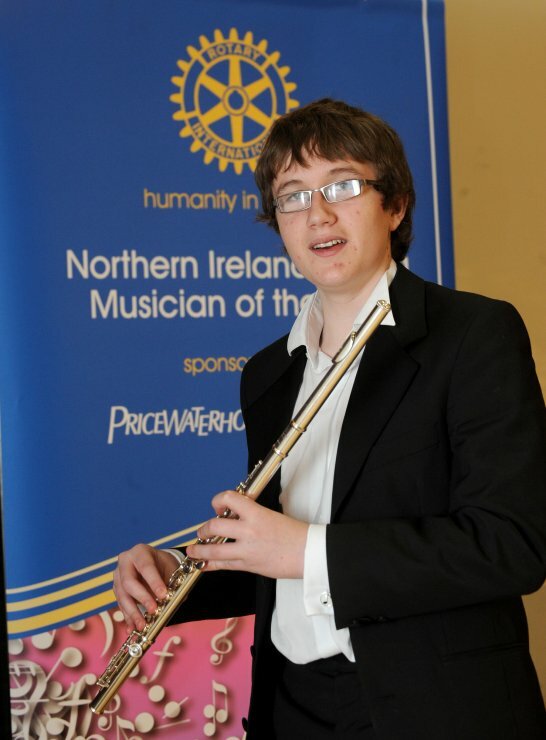 In the impressive surroundings of The Harty Room of Queens University Belfast on Saturday 3rd March, Andrew Douglas won the competition for the title of Northern Ireland Young Musician of the Year 2012 - photo in our Young Generation page. 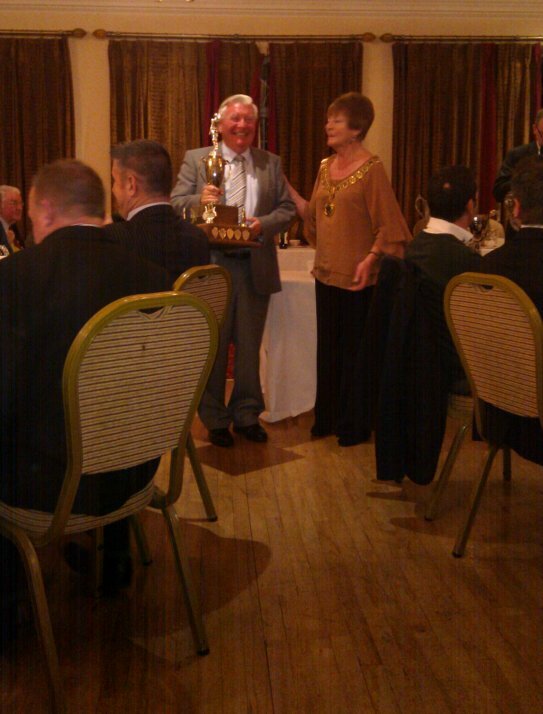 Ballygowan win the 2012 Flute Band Association’s Annual Own Choice Contest. Entries for the day’s playing was the best for several years with 25 bands participating - including welcome newcomers and the return of a long-term absentee. Seven bands competed for the Championship title, and Adjudicator Sandy Hay expressed his delight at the “fantastic day of music making”. He said that the standard of musicianship (in Northern Ireland) was second to none, and he was especially pleased with the differing styles of playing, which demonstrated how the bands here are prospering. He also commented on bands reaching such standards outside of formal musical training (of course this can only partially be applied as most bands do benefit from the musical education available to young people nowadays - certainly Ballygowan is committed to developing our youngsters). Mr. Hay then explained what he had been looking for in the performances; he referred to the quality of arrangements which give players a chance to shine. He wanted to hear the percussion sections complement the rest of the band; he also wanted musicality, good ensemble playing, tuning and intonation throughout performances. Before calling the results, he commented on the advent of the “big” flutes and how they have contributed to the quality of sound in flute bands. Kellswater were placed third with their performance of Verdi’s Silician Vespers, Ballylone were second with Tchaikovsky’s Cappricio Italien (they also won the piccolo prize). Ballygowan won with Rimsky-Korsakov’s Capriccio Espagnol, and also won the percussion prize, and the interpretation prize with, in the adjudicator’s words, a “stunning interpretation”. The day was rounded off nicely for us by the presentation on behalf of Trevor James Flutes* of a £1,300 alto flute. Once again our thanks and congratulations go our music maestro Dr. Windsor Hylands. On Sunday 11th December 2011 a group of band members played at La Mon House hotel, entertaining families arriving for Christmas dinner with carols and festive music. Turned out to be a great afternoon! On 07 December 2011 the Band filled a long-standing engagement for the Ballygowan Community Association - their Christmas Carols/Children’s Party. There was a different format this year, starting with a choir of young people from the area. Everyone enjoyed the singing very much, and it was of a very high standard with mostly new arrangements of well known carols. The Band also went down very well, and one little boy, Samuel Walker, got a pleasant Christmas present. After requesting if he could have a go with the baton, he was chuffed to be allowed to conduct “Rudolf the Red-Nosed Reindeer”. Before the finale, the Mayor of Ards Councillor Mervyn Oswald spoke to the gathering. He thanked the Band members for their very enjoyable music and he congratulated the Band for their clean sweep at the recent World Championship. He also added that we would be invited to the Mayor’s Parlour for a reception at a suitable date in the near future. At the outset he did jokingly say that he was a tad disappointed not to have had the chance to conduct, and he had not quite made it to his seat when Conductor Mark Douglas handed him the baton. After a very brief lesson he made an excellent fist of conducting the famous Radetsky March - click for photo. The Band led the praise at the Annual Lisburn Area PSNI Carol Service on the evening of 06 December 2011. This was a very successful and very well attended event, and we were indeed privileged to be asked to play. Also contributing were the Central Primary School Choir and the Choir of Christ Church, Lisburn. Musical Director Dr. Windsor Hylands receives the trophy for Best Interpretation at the 2011 World Flute Band Championships. NIBA President Margaret Campbell made the presentation - click for photo. Some members of the band played a short programme of music recently at a function in Ravara Orange Hall. We received a warm welcome and think our music was enjoyed by all. Many thanks to Ravara Pipe Band for the invitation. The first day of the 2011 Northern Ireland Band Championships was held on Saturday 15 October , and it was a great day for Ballygowan with a clean sweep of all available prizes. The adjudicator was, as last year, Donald Finlayson, a music graduate from the University of Glasgow and a flute player. He claimed he had an absolute ball of an afternoon, and added that the flute players of tomorrow want to come and hear the standard at this contest. He also commended Sir James Galway as a product of our system, who had listened widely to musicians across the world, and had transformed flute playing. The adjudicator went on to commend the arranger of the two pieces, John Bryce. He then said that he had been listening for the “Wow” factor, and that he had never heard as much double tonguing in a single day. In his closing comments he said the winning band had outclassed the rest – a professional performance in all sections. Special congratulations to Andrew Douglas who won the piccolo prize (that’s a double as he also won it at the Own Choice Contest in February). We owe our thanks and congratulations to our musical director, Dr. Windsor Hylands, who won the interpretation prize - again! The percussion section was rated the best of the day, and the adjudicator named Ballygowan as the best of the whole day’s performances. The music consisted of two pieces: Liebesverbot (The Love Ban – or The Novice of Palermo) by Richard Wagner, and Speedy Gonzales by Henry Mancini. Liebesverbot is a comic opera in two acts by Richard Wagner based on Shakespeare’s Measure for Measure. It was set in Palermo in Sicily in the 16th Century, and is rarely played nowadays – indeed it had an ignominious start. Under-rehearsed, the first performance was a shambles and only a handful of people turned up for the second night. The story line is based on the banning of promiscuity during a carnival, and Claudio is sentenced to death when his beloved Julia falls pregnant. The people later freed Claudio, but these indiscretions of youth came to haunt Wagner and he later renounced such free love. Richard Wagner was born in Brühl, near Leipzig in Germany on 22 May 1813. His father died of typhus when he was only six months old and his mother subsequently remarried and they moved to Dresden. Sadly, his step-father died when he was eight years old, and they moved back to Dresden where he received his first formal musical training. He later studied music at the University of Leipzig. From an early age he had been hooked on theatre and he harboured a desire to follow this career path. It was probably not surprising however that he became an opera composer, known especially for his rich harmonies, and unusually for an opera composer, he was his own librettist. He is also credited with being the first to face the orchestra while conducting. His best known works are The Flying Dutchman, Tannhäuser, Der Ring des Nibelungen and Die Meistersinger von Nürnberg. He also had his own opera house built, the Bayreuth Festspielhaus, which has been a Mecca for opera lovers ever since. In his personal life Wagner had his problems: his personality, money shortage, outspoken views on music, and his political views are well documented. He died on 13 February 1883, leaving the world, in musical terms, a much richer place. Speedy Gonzales was an instrumental number in Henry Mancini’s 1961 album Mr. Lucky Goes Latin. Henry Mancini was born on 16 April 1924 in Cleveland, Ohio, USA to Italian parents. He received flute lessons from the age of eight and piano lessons from twelve, and at 19 joined the Juillard School of Music. His musical career had to take a break when he was drafted into the army and he joined the famous Glenn Millar Orchestra. He later went into films and wrote a great number of songs and scores including The Glenn Millar Story and The Benny Goodman Story, and songs for most of the American Artists of his time e.g. Connie Francis, Trini Lopez, Johnny Mathis, Paul Anka, Andy Williams and Matt Munro. Mancini also performed in hundreds of symphony performances and conducted nearly all the leading symphony orchestras of the world. He died on 14 June 1994 and left this world with a legacy of wonderful music. In his life time he received 4 Oscars, 20 Grammy Awards and 9 Academy Awards. Congratulations to our senior percussionist John Presho who celebrated his golden wedding anniversary on 18 October 2011. He and Sylvia were treated to a surpize (call that shock) party in La Mon to which band members were invited) - an enjoyable evening was had by all. 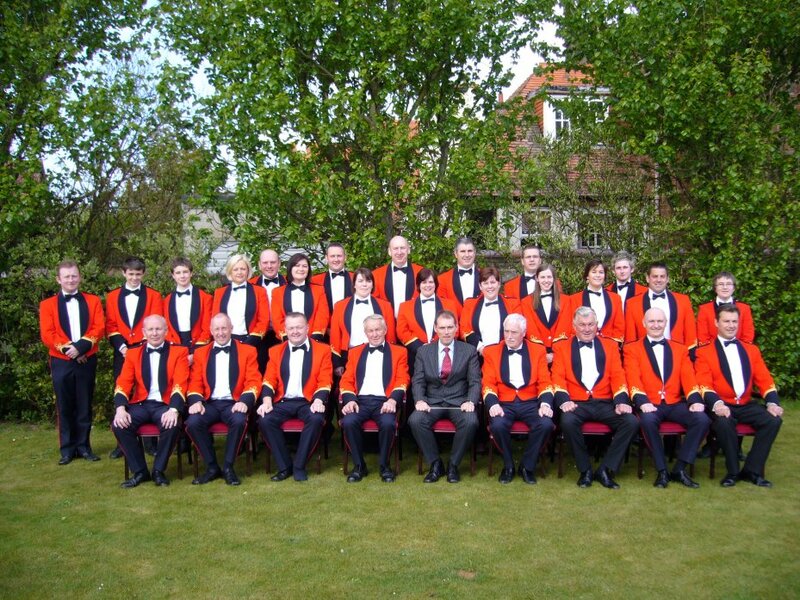 A large ensemble from the Band played in Carrickfergus on 30 September 2011 at a Masonic dinner. We were very well received and the guests, who by their own admission, left with a new perception of Flute Bands. The Band played in Botanic Gardens, Belfast on Sunday afternoon 18 September 2011. We were the third of four bands to play at the annual end of season park engagements - coinciding this year with the Autumn Fair. Our appreciation and thanks go out to the Belfast Parks Team who organised the marquis for the bands - this makes for a great atmosphere for the players and especially for those who came along to listen to us. Just as last year’s event, the show was stolen by 15-year old Andrew Douglas with his two piccolo solos. We sold a few CDs on the day, and one satisfied customer wrote to us saying: “As a lover of flute bands. I had the pleasure of listening to Ballygowan FB on Sunday in Botanic Gardens. The music playing was the best I have heard in a long time. I was only sorry when it ended. I also bought your wonderful CD of favourite marches which I play constantly. Thank you all for such a musical day. Wishing the band every success in the future”. Thank you very much to our conductor, James. The Band gave a concert in Lord & Lady Dixon Park on Sunday 04 September 2011. They say most things come in threes, and this was the third successive time at this venue that the weather was less than kind. Unfortunately there was no marquis on this occasion and rain stopped play. Our apologies to those who braved the weather, but our flutes are expensive and do not benefit from a good soaking! On 17 June 2011 the band played a short concert in Saintfield High School. The concert also featured the Ravara Pipe Band and the School Choir. The event was organised to mark a staff retirement, and a voluntary contribution was requested from the attendees for school charities. Our Night at the Races at Dougie’s Farm on Friday 2nd September 2011 turned out to be great evening’s craic, even if the attendance early on was a bit low (the Northern Ireland match was a distraction). Dougie himself bought the last horse, and no doubt the Band funds were boosted somewhat at the end of the night. On Sunday 17 July 2011 the Band played in Lord & Lady Dixon Park to help celebrate the end of Rose Week. Unfortunately the weather was not good and attendance numbers were restricted to the dedicated - this did not prevent the members and conductor from putting on a very good show. The Band had a great day in Comber at the 12th of July celebrations. The weather was fantastic, the public were out in force, and the Band was playing exceptionally well - lots of photos in Facebook. Our annual BBQ was held on Friday 10 June 2011 and a grand time was had by all. Visit our scrapbook page or our Facebook for some photos. Susan Rigby, Andrew Douglas, David Mays, Victoria Gibson, Audrey Spratt, Victoria Watson, Laura McBride, Stephen Gibson, Taylor Ross, Johnathan Gourley, Matthew Gourley, John Dawson, Stephen Carse, Jim Gourley, John Douglas, Robert McMurray, Geoffrey Gourley, Mark Douglas, Brian Kerr, Darren Canmore. It's as you were after the AGM with Dougie Gourley continuing as Chairman, Victoria Gibson as Secretary and Robert McMurray as Treasurer. The Flute Band Association's annual Own Choice Contest was held in The Island Civic Centre, Lisburn on Saturday 26 February 2011, and seven bands competed in the championship section. The adjudicator was John Bryce who was not a stranger to flute ensembles, and in his remarks he referred to the "absolute stunning and amazing" standard of the bands in the top section. He also picked out the arrangers of the music and commended their commitment. He advised percussion players not to forget that they had to complement the flute playing which demonstrated "loads" of cracking players, and he had a fun poke at the thankless task of conductors. His adjudication produced a third place for Ballyclare, a close second for Ballylone, and he placed Ballygowan first. Ballylone won the percussion prize, Ballygowan's young Andrew Douglas won the piccolo prize, and the interpretation prize went to Ballygowan's conductor Windsor Hylands. Mr. Bryce's parting comment was that he had never heard a performance like that of the winning band. The success meant that Ballygowan had earned a top-two finish in the Own Choice Contest for the eleventh straight year. Congratulations to our solo G-treble player Richard Douglas who, for the third year in a row, led Ballymena Young Conquerors to first place in Grade 2. The bands' test pieces were Capriccio Espagnol ( Korsakov), Four Dance Episodes from Rodeo (Copland), Sheherazade (Korsakov), Polovtsian Dances (Borodin), William Tell (Rossini), Capriccio Italien (Tchaikovsky), Morning, Noon and Night (Suppé). Ballygowan played Capriccio Italien by Pyotr Ilvich Tchaikovsky. Tchaikovsky composed Capriccio Italien in 1880 after a visit to Rome. Apparently he was very taken with much of the music he heard there, especially the folk music, and the fanfare at the beginning reflected an army bugle call heard from his hotel. It is also said that he found inspiration in Glinka’s Spanish Pieces. The work was initially well received, but the composer is reported to have later doubted if the work contained any musical merit. He subsequently arranged it for piano. 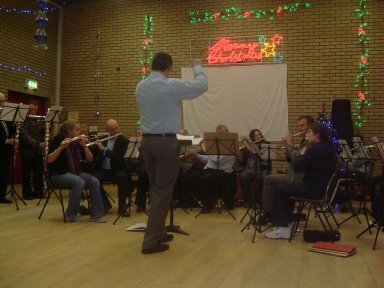 On Saturday 11th December 2010, the band led the praise for the carols at the Christmas Tree Party for the Community Association and more especially for the younger set. On Friday evening 3rd December 2010 a large ensemble from the band played in First Comber Presbyterian Church to entertain visitors during their Flower Festival - the theme of the festival was "JOY" in keeping with Advent. First Comber Praise Band provided the music on Saturday evening, Comber Silver Band on Sunday afternoon, and The PSNI Women's Choir participated in a very enriching and enjoyable Sunday evening service. In spite of the icy weather the project was a huge success for First Comber Presbyterian and they will be forwarding several thousand pounds to the World Development Appeal, which provides support to very poor people in far-off lands by helping them to help themselves. We wish to express our thanks to Bandsman, Arranger & Composer Alex Abbott for his score of the sacred song "The stranger in Galilee". Our Vice-President Bob McMurray had asked him about it at an earlier date, and Alex brought it to the World Championship in Armagh (especially personalised). He also included another score for Ballygowan.Alex is well known throughout Scotland, Northern Ireland and USA for his arrangements and compositions for flute ensembles, and we simply wish to record our appreciation of his efforts past, present and future. Manuel de Falla was born in 1876 in Cadiz in Spain and studied music in Madrid. He became very interested in native Spanish music, and the Three Cornered Hat started life as a ballet called The Magistrate & The Miller's Wife. Falla made a major contribution to his country's music and appeared for a number of years on a Spanish bank note.The Adjudicator Donald Finlayson, himself a flautist, commended the high standard of flute playing - indeed he added the words "ridiculously high". He said the flute students on the British mainland should be coming to this contest to hear for themselves what good flute playing is all about (he even suggested that the professionals should do likewise. He also commented on the arranger (David Heaney) of Manuel De Falla's set of dances "The Three-Cornered Hat", saying how "it really worked" and how suitable it was for the occasion. He added that the piece demanded technical mastery and musicality, and while all the bands demonstrated one or the other, only a few achieved both. He then admitted to having to nit-pick and agonising before deciding between the two best performances. Kellswater Flute won the split decision over Ballygowan and our congratulations to them for their first win at this level. Congratulations are also due to our conductor Windsor Hylands (back from retirement) for winning the interpretation prize - yet again), and also to our solo G-Treble player Richard Douglas who guided The Young Conquerors Flute Band from Ballymena to their third successive victory in the Grade Two - they are now promoted to the championship section..While congratulations are flowing, spare a thought for Carolyn Watson who was the first female to conduct a winning performance in this World Championship contest (with Ballygowan in 1990, and with Ballyclare in 2004 & 2006), has now done it a fourth time - with Kellswater. 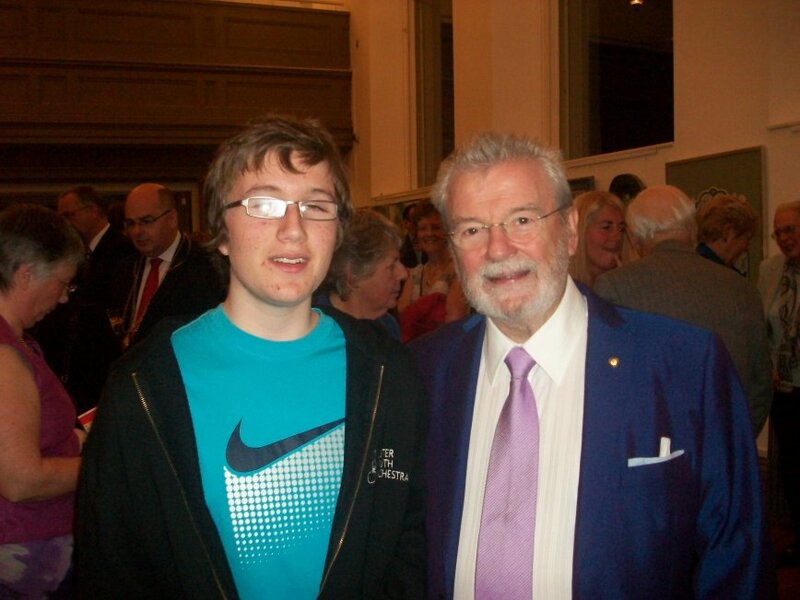 The only two people who at twelve years of age won the Flute Band Association's competition in Under-13, Under-16 and Open Solo in the same year - Sir James Galway (then of 39th Old Boys) and Andrew Douglas of the Ballygowan Flute Band. The photo was taken in September 2010 at Belfast's Ulster Hall. The occasion was an honorary reception for Sir James and part of Belfast City Council's first ever Belfast Music Week. Sir James played the tin whistle, did a short talk and then mingled with the guests. The 2010 annual barbeque band photo (click here) at Dougie's farm. A good time was had by all, and some money was raised for Band funds. This year's away day was back to Troon for the S.A.F.B.A. 2010 Spring Contest. It was a good day for Carluke Primrose, who claimed the two first prizes and best overall. Ballygowan were second in both. Click here for photo. Seated (from left): S. Gibson, G. Gourley, T. Gourley, D. Gourley, M. Smith (Conductor), J. Douglas, J. Gourley, D. Mays, R. Douglas. On 12 March 2010 the band played in a concert in Drumilly Church hall, Hamiltonsbawn, County Armagh. The Presbyterian Church there run a charity concert every year and we were delighted to accept the invitation to contribute. The concert also featured the local Silver Band. The Civic Centre in Lisburn was the venue for the 50th Annual Own Choice Contest on Saturday 27 February 2010. For most flute band people this is the best day of the year, because of the variety of music on offer, but for some, nothing much changed other than the date, since last year's result was repeated exactly (Kellswater won it, Ballygowan were a close second and Hunter Moore finished third). The adjudicator, Hughina Naylor was very well qualified for the job - being a flute player and flute teacher. It was also her fourth time to perform this function, and she stated how it was a privilege and that she was humbled by the standard of flute playing. She also referred to the brilliant arrangements of David Heaney (Ballclare) and Mark Douglas (Ballygowan) - they were responsible for no fewer than nine of the test pieces. We would like to invest a few lines in appreciation of our Solo G-Treble player, Richard Douglas, who, for the third successive year, directed and conducted Ballymena Young Conquerors to first place in Grade 2. Also to Richard's partner on the first G-Treble, the youthful Victoria Watson, who directed and conducted Roses Lane Ends to a win in Grade 1. Some examples of the music on offer: Sicilian vespers (Verde), The Accursed Huntsman (Franck), Fingals Cave (Mendelssohn), Hungarian Rhapsody No. 2 (Liszt), William Tell (Rossini), Rodeo (Copland), Slavonic Rhapsody (Friedman), Poet & Peasant, Light Cavalry (both by Suppe). On a snowy Friday evening of the 29th of January 2010, members and friends of the Ballygowan Flute Band met in La Mon House Hotel for a nice meal and an evening's fellowship, and in particular to say "thank you" for the contribution over 15 years of our recently retired Musical Director Dr. Windsor Hylands. During this period the band returned 33 wins in various competitions - something that the members would love to do again, but there are other excellent outfits out there who will have a say in that! 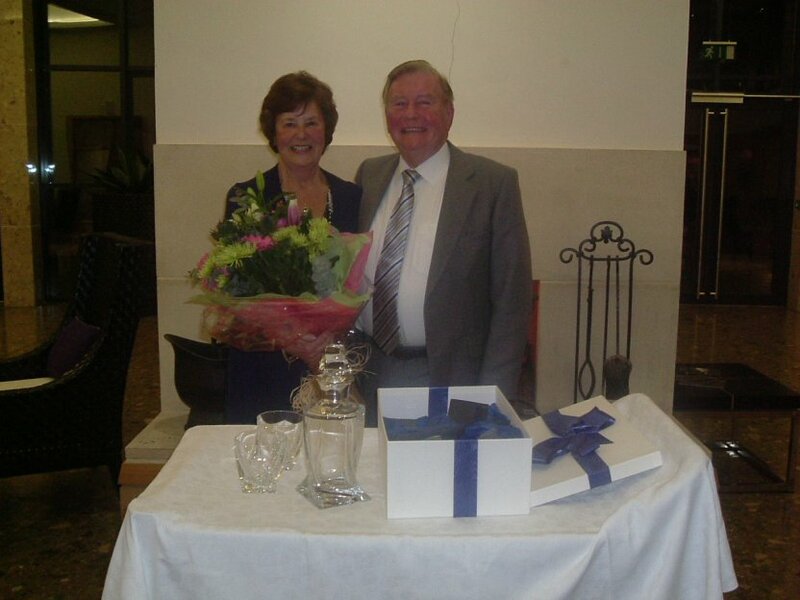 His wife Isobel received a lovely bouquet and Windsor received a beautiful set of crystal decanter and glasses (presented resp. by Sarah Bass and President Sadie Strain). Ballygowan players and followers were delighted on Saturday 24th October evening to hear the adjudicator call our name as 2009 winners. The test piece was not a popular one, but none the less a good test. The top three bands made an excellent fist of it, but the proof of the pudding surely came within the adjudicator's remarks. Because the music was not at all well known - indeed it was composed by a pianist for pianists - he referred to having looked forward with interest to hear how the respective bands would "make music out of it". The success was all the sweeter because it was our conductor, Windsor Hylands' last contest before he retired from active banding. Windsor worked very hand - not just in front of the band, but also at home - to make the most of this piece of music, and it capped a magnificent and memorable year for him. In the Flute Bands Association Own Choice Contest in February he won the interpretation prize for Dvorak's Carnival Overture. 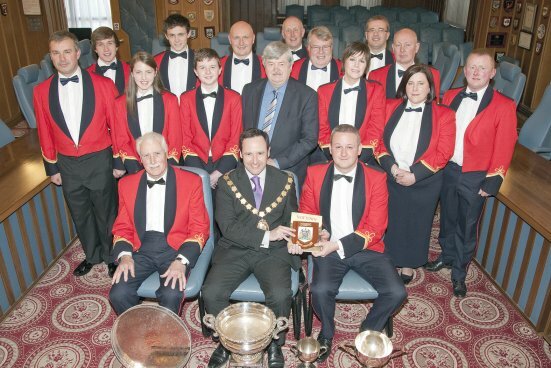 In the Scottish Own Choice Contest in May, Ballygowan were judged the best overall band, and he was awarded the interpretation prize for this year's World Championship. All-in-all it is a fitting tribute to one of our country's most respected musical directors. The number of first places that Dr. Hylands landed in his career may not be recorded, but it is probably more than 75! Enjoy your retirement Windsor, and accept your most sincere thanks for everything you did for us! The test piece for 2009 was Theme & Variations by Taneyev, a piano piece arranged for flute by P.Walton. The arranger actually composed the finale specifically for this contest. Sergei Ivanovich Taneyev was born near Moscow in 1856. He began taking piano lessons at age five, and when he was nine entered the Moscow Conservatory - he was later to study under Tchaikovsky. He graduated in 1875, the first student in the history of the Conservatory to win the gold medal for both composition and performing (piano). He was also the first person ever to be awarded the Conservatory's Great Gold Medal. Taneyev was an accomplished performer and composer, and Tchaikovsky came to respect his professional opinion above most others (even though his frank opinions sometimes hurt the sensitive genius!) He was the soloist in the first Moscow performance of Tchaikovsky's Piano Concerto No. 1, and he was to perform other Tchaikovsky works for piano and orchestra. His pupils included Rachmaninov. The Officers and members of the Ballygowan Flute Band are delighted and proud to have been chosen as part of an optional area of study for those sitting their GCSE Music in 2011. Students will be expected to develop their knowledge and runderstanding of the musical traditions in Ireland through a study of a number of pieces - in our case it is the march Le Reve Passe (The Soldier's Dream). Last away day for the band was in early May 2009 when a fairly large group from the membership travelled to Troon to compete in the Annual Spring Contest organised by the Scottish Amateur Flute Band Association - the opportunity was not lost to have some fun along the way! Eight bands participated, each playing a march and a test piece, and there were prizes for the march, for the test piece and prizes for entertainment. At the end, all points gained by each band were added up and there was a best overall prize. It was a good day for Ballygowan winning the march (with Bolts & Bars) and the test piece (Irish washerwoman, Champions Theme and Dvorak's Carnival Overture). We also collected the prize for the best piccolo performance as well as the entertainment prize - which also guaranteed that we were the best overall band on the day. Highlight for everyone in the hall including the adjudicator was our solo G Treble player Richard Douglas' performance of the Champions Theme. All-in-all a good day at the office! Jimmy Greenaway passed away earlier this summer after a period of illness. Jimmy started his banding career with the 39th Old Boys but moved soon afterwards across the city of Belfast to The Ravenhill Temperance - he was also on the founding committee of the Gertrude Flute Band. In an earlier life Jimmy taught the beginners in Ballygowan, before a career move took him to South Africa. On return from the dark continent he rejoined the Ravens, but also guested from time to time with Ballygowan. Indeed, with Ravenhill not competing in the 2008 World Championship Contest, Jimmy played with us. He has played in Ballygowan colours on many occasions - indeed he was to guest with many bands throughout his life. Clicke here for photo - Jimmy is on the left with Mark Douglas, and the occasion was the 2006 Black Preceptory Parade in Scarva. He is being sorely missed.